If you use Instagram and you’ve ever wanted to download all the pictures you’ve taken you’ve probably noticed there is no built-in option to do so. Thankfully there are several free options that let you back up all photos from Instagram and export them all directly to your computer. We’ve narrowed it down to the two best solutions, a native OS X app and a web app. Both serve the same function and will download all of your Instagram pictures for local storage. The biggest caveat with both solutions though is they download the photos at a paltry 612×612 pixel resolution, though that is likely an Instagram limitation and not the applications fault (if anyone knows a workaround for that, let us know!). 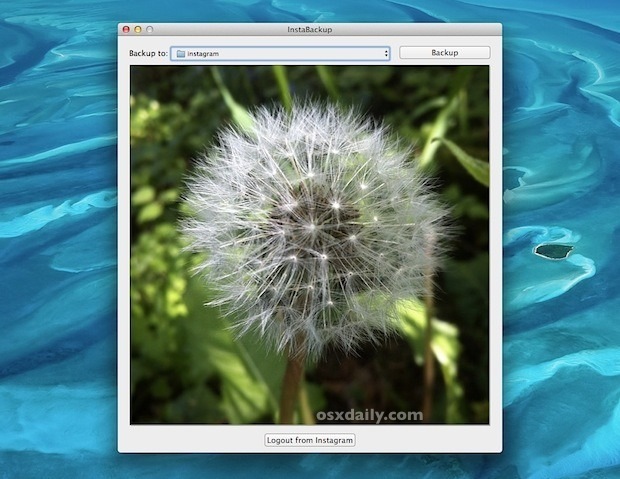 Instaport is a free web-based alternative that is therefore cross-platform compatible, allowing it to work in Mac OS X, Windows, or just about anything with a web browser and that can open zip files. 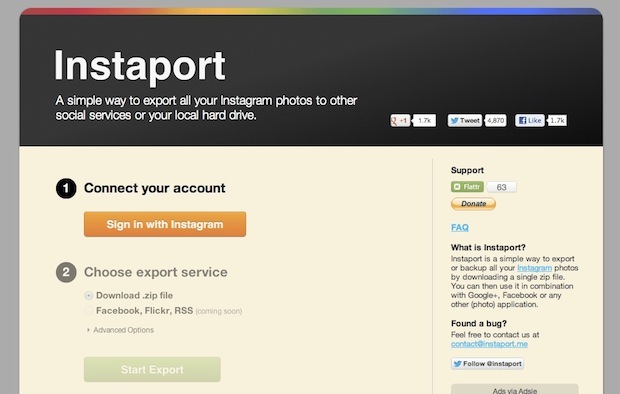 Go to Instaport and authenticate with your Instagram login, and click “Start Export”, and soon you’ll have a bundled zip archive of all the pictures downloading to your computer. InstaBackup, shown in the screenshot up top and below, is a small app for Mac OS X only but it gets the job done very quickly. Using Instabackup is a matter of launching the app, authenticating with Instagram through the default web browser, and setting a folder to download the images into. Each picture is named as their original upload date, which is a nice touch if you want to have an idea of when each picture originated. If you’d prefer a free choice, Instaport, which we already mentioned, is a web based alternative that works on any platform and is not a paid app. Once you have pictures stored locally, you can do whatever you want with them. Keep the images around your hard drive for backup purposes, transfer them to an iPad since there still isn’t a native Instagram app, turn the pics folder into a screen saver (or get Screenstagram if you want your Instagram feed as a screen saver instead), import them into iPhoto, or whatever else you can think of. I’m pretty sure you can access higher resolution pictures from Instagram but I can’t remember how to do so. Used first one. Thank you. Same works great just wish resolution was higher. The resolution is dependent on how you upload the images to Instagram I think, if you use Instagram camera it’s full res, if you upload from Camera Roll it reduces it. I coud be wrong, this may be resolved by now, but it is listed in Instagrams web help. You can also use ifttt to save every photo you take on Instagram to Dropbox automatically. My iPhone automatically saves all of my Instagram photos in my photo library. If I want to use them for anything else, I just email them from my phone. I use 4K Stogram for back up my photos on PC or Mac. Really the easiest application I ever used. Try out http://downgram.com it’s great and easy to use. Use IFTTT App. Use the Recipe “IF I like a Photo on instagram, Save it to dropbox”. Et Viola, Lots of Instagram Photos on Dropbox. Couldn’t get through to app following your link. I’ll try again later.